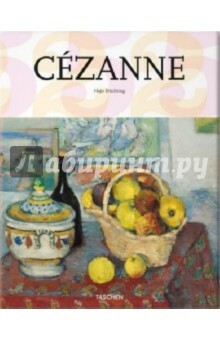 Perhaps best known for his exceptional apples and pears, Paul Cezanne (1839-1906) was one of the founding fathers of modern art. Though he was underappreciated and highly criticized during his life, as time passed Cezanne's work came to be considered of inestimable importance. His method of experimentation with abstraction and perspective was an important precursor to modern painting, particularly cubism. Hajo Duchting (b. 1949 in Dusseldorf) studied art history, philosophy and archaeology in Munich, where he gained his doctorate in 1981 with a thesis on Robert Delaunay's Windows series. After working in museum and adult education, he moved on to teaching posts and guest professorships at the universities of Munich, Kassel, Leipzig, Saarbrucken and Mainz. Since 2004 he has taught painting and colour theory at the Mediadesign Akademie in Munich. Duchting has published numerous articles on the art of the modern era, colour theory and the teaching of art and has authored a number of TASCHEN titles, including Paul Cezanne (1988), Wassily Kandinsky (1990); Robert and Sonia Delaunay (1993) and Georges Seurat (1999).